I loved to watch my mother cook and bake – but apparently I missed one thing! My first time roasting a whole chicken when I first got married was a total disaster. I forgot to take the plastic bag of gizzards, liver, and neck out of the chicken before I put it in the oven! For some reason, my husband wasn’t too keen on eating melted plastic! (I switched to chicken parts after that!) When I was growing up – we rarely ate out! My first experience with pizza was with DePasquale in Hartford after the Weaver senior high prom. I thought it was gross – and now I love it! The few times we ate out – it would be at Robbins Deli across from the State Theater. Big, fat, juicy knockwurst (Kosher) – and beans served by Speedy Cohn – the generous local waiter at Robbins! It was so much fun to eat and watch the theater performers come in after the shows. I have always hosted Jewish holiday dinners – I love to cook and feed my family! Now, however, we have a new rule! 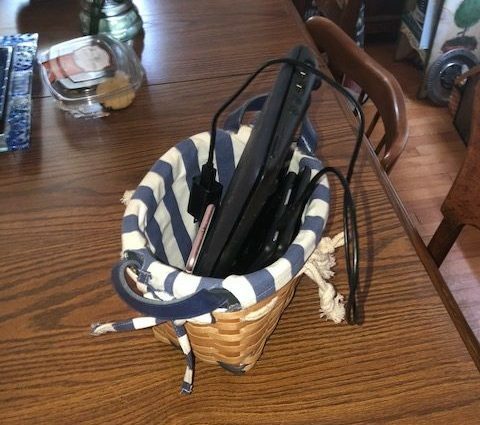 When my grandchildren arrive, they find a basket at the door with a note: “Please put all electronic devices in this basket until after dinner!” Makes for great dinner table conversation with everyone communicating with each other!